This is run by an American lady, Melissa Diamond, and she is unreal! She makes everything look so simple and techniques that I would have thought were well above my skill level are made so easy with her instructions. She covers all kinds of things including making a cake from scratch, making buttercream, covering cakes in fondant, making figurines, chocolate wraps, cupcakes, carved cakes, piping – there’s not a lot that she doesn’t teach in her courses and if there is something missing, you can send her a message and she may well cover it off the following month. At least one new video tutorial is uploaded every month, and usually there is a blog style tutorial added too, where it is just text and photos (which sometimes suits me better especially if I am using my iPhone!) The cost is ridiculously cheap -$30US / YEAR! It is 100% worth every cent. www.mycakeschool.com This is a sample of one thing I have made following her video tutorial for a sleeping baby. My first attempt and so easy! This is also an American website and these classes are VERY professional. Most of the instructors are all names that you will know as the ‘gurus’ of cake decorating. All of the courses can be accessed forever after you have purchased them and there is also an iPhone app which I have used to watch some videos when I don’t want to be sitting in front of the computer. The course is broken into chapters so you can skip to the bits you want to watch and it also seems to remember where you finished up on your last session so you don’t have to go searching for the place to continue. There are course notes for each course, templates for the designs used, a 30 second replay button and a forum to chat with other students. The courses are lengthy, informative and feel like you are in a real classroom! Have a look at what they offer… there are some free courses to give you a taste of what is included so you can get started straight away. This is an Australian website and the face of it is Louise Vansleve. She has a team of famous Australian cake decorating legends and posts 2 new tutorials every month. Each course comes with an e-book with step-by-step instructions and photos that you can download and print for your records. Flick over to the home page now to watch a video and find out more about the courses. You will also get a free course showing you the basics. My favorite part of this website is their Facebook forum where cake decorators can ask questions and share photos and recipes – it is an informative and friendly little community! 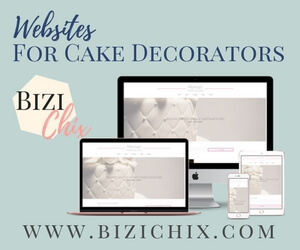 Rebekah Allan is an Australian lady who has her own cake decorating business from home and franchises to other people wanting to work for themselves. She also has an extensive range of videos teaching you the basics of making buttercream and ganashe through to tricky techniques like making a topsy turvy cake and inserting dowels. The courses are fun and she has a great personality! But if you go to her YouTube channel you will find a bigger range of videos for FREE! As I discover more worthwhile online tutorials I will add the details on this page… I hope you enjoy learning!